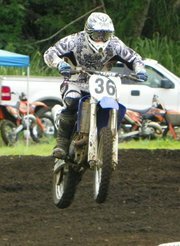 The 808 MX/ATV Association finished up its 2011 season with races in December. The 2012 season will begin in March. For more information, contact 963-5448 or 808mxatvassociation@gmail.com. The 808 MX/ATV Association will have free riding from 10 a.m. to 4 p.m. Jan. 22 at Hilo Motocross Track. Dirt bikes and quads are welcome. The assocation’s season begins in March. For more information, call Kevin at 963-5448, email 808mxatvassociation@gmail.com or visit the club’s Facebook page. The 808 Mx/ATV Association held racing on Saturday. The next scheduled races are July 24. For more information, email hollycoak@yahoo.com.